A bright red bulb showing the reflections of the street, hangs from a Christmas tree in the Market Square in Michelstadt in Hessen, Germany in Europe. The light hits the Christmas tree ornament at the right angle as the sun dips behind the buildings and the reflections of the street are clearly seen in this red bulb. The beauty of Christmas around Hessen, Germany is not only seen throughout the streets as it reflects everywhere around town, especially in the shiny ornament.Decorations on a christmas tree in the Market Square in Michelstadt, Hessen, Germany, Europe. 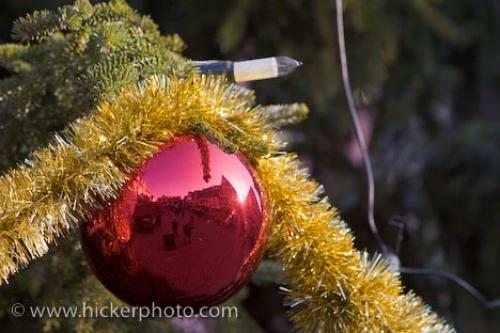 Photo of the Christmas tree ornament and the reflections in the Market Square in Michelstadt, Hessen in Germany.